← My blog is 1 year! Context is important. Statements that are completely normal and understood within my family can take on a whole new meaning when out in public. I remember the first time that I realized that this sentence does not always have the meaning that I intended. I had a friend over, I must have been 13 or 14 years old. We were about to eat lunch. I had tested my blood sugar and my number was high. The statement, “I’m high, Dad,” was followed by a shocked look from my friend. “What? 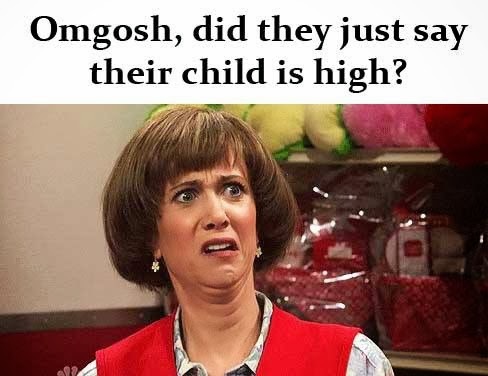 Did you just tell your dad that you’re high? !” I returned my friend’s confused look, in my naivety being high only meant one thing, “Yeah, my blood sugar is really high right now.” My friend laughed, “Ohhh, that’s not what I thought you were talking about.” I think back and laugh, I’ve said that statement so many times, out shopping, out to eat, walking around. It’s funny to think about how many times someone overheard that comment and what they must have been thinking. Now I make sure that when I’m out in public to change the statement to “My blood sugar is so high right now,” to avoid any misinterpretations. This got me thinking about all the other awkward situations that my diabetes has gotten me into over the years. While not quite embarrassing, this situations usually do require some extra explanations. I remember a time in middle school when I was wearing a skirt to class. I was wearing my pump in a strap around my leg since I didn’t have any pockets. I was sitting down when I started hearing this high pitched noise. Other people around me started hearing it too. This was before everyone had cell phones so we were all looking around trying to figure out where the sound was coming from. I shifted in my chair and the long drawn out beep was followed by 3 shorter beeps. I somehow had sat in such a way that a button had gotten held down on my pump. Everyone stopped and stared at me, it was clear that the unusual sound came from me. Not one to awkwardly disrupt the class and explain that I’m not a robot and in fact the noise was my insulin pump, instead my cheeks turned a bright ride as I mouthed a silent, “Sorry”. It’s not just the beeps that get people’s attentions. This past weekend I was at a friend’s house party and left my purse on a chair where a friend was sitting. “Reva, is this your purse?” I replied that it was. “It keeps vibrating.” With my phone visibly in my hand, curious eyes turned to me to hear my explanation for my vibrating purse. “Um well yea, it’s my thing, blood sugar, um thanks.” I grabbed my purse, rustling inside to find Gigi and put wandering minds to rest. And I can’t forget about all the times I’ve poured the entire contents of a fruit snack pack in my mouth at once as strangers looked on with curious expressions, or got my pump tubing caught on knobs, wrapped around seat belts, buttoned into my jeans, etc. I’ve had my fair share of awkward diabetes moments, but I’ve also had many non diabetes related awkward moments. When it comes down to it, I’ve learned the best thing you can do is just laugh about it. us. I can not wait to read far more from you. This is actually terrific site.